East Carolina University (ECU) is a public research university in Greenville, North Carolina It is the fourth largest university in North Carolina. Founded on March 8, 1907 as a teacher training school, East Carolina has grown from 43 acres (17 ha) to almost 1,600 acres (647 ha) today. The university's academic facilities are located on six properties: Main Campus, Health Sciences Campus, West Research Campus, the Field Station for Coastal Studies in New Holland, North Carolina, the Millennial Research Innovation Campus in Greenville's warehouse district and an overseas campus in Certaldo Alto, Italy. ECU also operates the Coastal Studies Institute. The nine undergraduate colleges, graduate school, and four professional schools are located on these four properties. All of the non-health sciences majors are located on the main campus. The College of Nursing, College of Allied Health Sciences, The Brody School of Medicine, and School of Dental Medicine are located on the health science campus. There are eleven social sororities, 16 social fraternities, four historically black sororities, five historically black fraternities, one Native American fraternity, and one Native American sorority. There are over 400 registered clubs on campus including fraternities and sororities. Public Laws of North Carolina, 1907, Chapter 820 titled An Act to Stimulate High School Instruction in the Public Schools of the State and Teacher Training is the official law chartering East Carolina Teachers Training School (ECTTS) on March 8, 1907 by the North Carolina General Assembly. The chairman of its original Board of Trustees, Thomas Jordan Jarvis, a former Governor of North Carolina now known as the "Father of ECU", participated in groundbreaking ceremonies for the first buildings on July 2, 1908 in Greenville, North Carolina and ECTTS opened its doors on October 5, 1909. Although its purpose was to train "young white men and women", there were no male graduates until 1932. In 1920, ECTTS became a four–year institution and renamed East Carolina Teachers College (ECTC); its first bachelor's degrees were awarded the following year in education. A master's degree program was authorized in 1929; the first such degree granted by ECTC was in 1933. Progress toward full college status was made in 1948 with the designation of the bachelor of arts as a liberal arts degree, and the bachelor of science as a teaching degree. A change of name to East Carolina College in 1951 reflected this expanded mission. Over the objections of Governor Dan K. Moore, who opposed the creation of a university system separate from the Consolidated University of North Carolina, ECC was made a regional university effective July 1, 1967, and assumed its present name, East Carolina University. The university did not remain independent for long; on July 1, 1972, it was incorporated into the University of North Carolina System, the successor to the Consolidated University. Today, ECU is the third–largest university in North Carolina with 21,589 undergraduate and 5,797 graduate students, including the 308 medicine and 52 dental students. East Carolina is separated into three distinct campuses: Main Campus, Health Sciences Campus, and West Research Campus. It owns two sports complexes: Blount Recreational Sports Complex and North Recreational Complex. It owns a field station in New Holland, North Carolina. The main campus, also known as the east campus, is about 530 acres (2 km2) in an urban residential area of downtown Greenville. The 158 buildings on main campus comprise more than 4.6 million square feet (325,000 m²) of academic, research, and residential space. Many of the Main Campus buildings feature the Spanish–Mission style architecture; inspiration drawn from Thomas Jarvis' time as an ambassador to Brazil. He wanted to bring the unique architecture to eastern North Carolina. On the main campus, there are five districts: Campus Core, Downtown District, Warehouse District, Athletic fields and the South Academic District. On the Campus Core, there are 15 residence halls which are divided into three separate neighborhoods. The distinct feature of the main campus is the mall, which is a large tree–laden grassy area where many students go to relax. In the middle of the mall is the replica of the cupola on the original Austin building. The varsity athletics fields are located south of the College Hill residential neighborhood. Fourteenth Street divides College Hill to the north, with the athletic fields to the south. Charles Boulevard borders the fields to the west and Greenville Boulevard borders it to the south. A residential neighborhood and Elmhurst Elementary School are the eastern borders. The northern portion of the area sits Dowdy–Ficklen Stadium, Minges Coliseum, and Minges Natatorium, along with parking. The Murphy Center, which is the primary strength and conditioning, and banquet building, is located between Dowdy-Ficklen and Minges Coliseum. The Tennis Complex, Ward Sports Medicine Building, Scales Field House, and the Pirate Club Building also surround Dowdy-Ficklen. The Ward Sports Medicine Building houses offices for football and basketball, Pirate Club, media relations, and the director of athletics. The Scales Field House provides locker rooms, offices and equipment storage. The Pirate Club Building houses a ticket office, other offices, and an area for Pirate Club members. South of those facilities is the Cliff Moore Practice Facility which has a pair of natural grass fields and one FieldTurf field designed exclusively for the football team. On the southern border of the practice facility is Clark-LeClair Stadium, which is the men's baseball stadium. It opened in 2005 and seats 3,000 in permanent seating with another 2,000 located in the outfield. At the southern end of the fields is the Olympic Sports Complex, which include women's soccer stadium, softball stadium, track and field facility, and Olympic Sports Team building. The Olympic Sports Complex was completed in 2011 with a price of $23.4 million. The Smith-Williams Center is a $17 million basketball development and practice facility, opened in 2013. The football stadium is planning for a $40 million upgrade. The upgrades will include a new press, club, and suite areas, and upper deck, all located on the south side. This addition will increase the capacity from 50,000 to 60,000. East Carolina has spent $92 million on athletic projects from 1998 to 2011. Including the proposed projects, this is increased to $145 million. The Health Sciences campus prepares health care practitioners across a full range of professions, including nurses, dentists, physical therapists, speech therapists, physicians, and more. Many graduates of ECU health sciences remain in the underserved East Carolina region to provide care in the area. It is situated beside Vidant Medical Center (VMC). VMC was originally Pitt County Memorial Hospital. After becoming a private non-profit hospital, the renaming occurred. VMC, an 861–bed flagship Level I Trauma Center, serves as the academic medical center for The Brody School of Medicine. Vidant Health owns VMC, leases or owns six and manages one. The area is about 2 miles (3.2 km) west of Main Campus on 206 acres (0.8 km2) with nearly 1,300,000 square feet (121,000 m2) of academic and research space in 62 buildings. Other buildings besides VMC include Brody Medicine Science Building, the East Carolina Heart Institute, Leo Jenkins Cancer Center, and the Allied Health building composed of the College of Nursing, Laupus Medical Library and College of Allied Health Sciences. The 117,000 square feet (11,000 m2) Family Medicine Center opened in the fall of 2011. Ross Hall, which houses the School of Dental Medicine, is just under 200,000 square feet. West Research Campus lies on approximately 600 acres (2.4 km2) 4 miles (6.4 km) west of the Health Sciences Campus. It consists of four buildings with 36,000-square-foot (3,300 m2) on the former Voice of America site. Approximately 367 acres (1.49 km2) are designated wetlands  and large areas of biology, botany and other sciences field study sites. It has an environmental health onsite wastewater demonstration facility which is open to the public and all educators. It is also the home of the North Carolina Institute for Health and Safety in Agriculture, Forestry, and Fisheries with an administrative and several support buildings. The School of Dental Medicine built 8 community service learning centers located in rural and underserved areas throughout the state of North Carolina. The fourth-year students learn and provide care for the community for one year in these community centers. All 8 community centers are currently active. They are located in Ahoskie, Elizabeth City, Lillington, Spruce Pine, Bolivia, Thomasville, Lumberton,and Sylva. The field station is located in New Holland, North Carolina. The area serves as a field station for the coastal studies, coastal resource management, and biology programs. The main goal of the field station is economic development into the region through both environmental education and eco–tourism. It also serves as a facility for small retreats and as a base for research on coastal issues. It was listed on the National Register of Historic Places in 1980. It is adjacent to the 49,925-acre (202 km2) Mattamuskeet Wildlife Refuge. North Recreational Complex (NRC) is an athletic complex located on a 129-acre (522,044.5 m2) parcel of land north of East Carolina University's main campus. The NRC is one of the Nation's largest recreational complexes. It will augment the Blount Intramural Sports Fields located behind the Carol Belk Building on Charles Boulevard. The first of three phases of the complex opened on September 2, 2008. Phase one includes eight lighted fields, a 5.6 acres (0 km2) lake with a beach, walking trails/areas, and a field house. The complex is located near the intersection of the North Carolina Highway 33 and U.S. Route 264. Phase II opened in August 2011, with the grand opening occurring on September 15, 2011. This phase includes a 5.6-acre (0.0 km2) lake on with a 51,000-square-foot (4,700 m2) beach. A 2,000-square-foot (190 m2) boat house is also located there. Canoes, kayaks and stand-up paddleboards can be rented at the boathouse for use in the lake. Other amenities include sand volleyball courts, horseshoes, grills, fitness equipment, six walking/running trails, a disc golf course, and an Odyssey Course which includes a 300-foot zip line. ECU houses and manages the UNC Coastal Studies Institute (UNC-CSI) which is an inter-university, marine research institute located on Roanoke Island in Manteo along the Croatan Sound on the Outer Banks, established in 2003 focusing on Estuarine Ecology and Human Health, Coastal Processes and Engineering, Public Policy and Coastal Sustainability, and Maritime Heritage. ECU is home to nine undergraduate colleges, a graduate school, and four professional schools. The oldest school is the modern day College of Education. The university offers 16 doctoral degree programs, 4 first professional degree programs, 76 master's degree programs, and 102 bachelor's degree programs. ECU's liberal arts college is the Thomas Harriot College of Arts and Sciences. It consists of 16 departments, making it the third largest College. The liberal arts college has its roots in the beginning of the university. The College of Business is a professional school consisting of six departments with undergraduate concentrations in each, plus the Miller School of Entrepreneurship and a Master of Business Administration and Master of Science in Accounting program. The college's beginnings came in 1936 when the Department of Commerce was organized. It later changed to the Department of Business Education, and then to the Department of Business. Finally, in 1960, the School of Business was formed. The college undergraduate program was accredited in 1967, and the graduate program was accredited in 1976 by The Association to Advance Collegiate Schools of Business. The college is a governing school of the Graduate Management Admission Council. The college runs a Small Business Institute to advise small business owners on how to succeed. The College of Education is the oldest and largest college at ECU. It houses and administers all of the education majors and an international open access journal, the Journal of Curriculum and Instruction. There are 17 undergraduate degree programs, 22 graduate degree programs, six advanced certifications, and the Doctor of Education program. The college prepares more professionals for North Carolina schools than any other university in the state. The college scored higher than other North Carolina universities when the state board evaluated teacher education programs in 2006. In addition, the Institution of Higher Education Performance Report showed ECU was first in the number of graduates who were employed in public schools across the state. The college is considered one of the exemplary professional preparation programs according to the North Carolina State Board of Education's Higher Education Performance Report. The College of Fine Arts and Communication comprises four schools that range from dance to design and broadcast journalism. The college officially opened on July 1, 2003, but can trace its roots to ECU founding; the school hired art and music professionals in 1907 to train teachers. The College of Health and Human Performance is made up of eight academic units and handles all of the recreational and exercise degrees at East Carolina University. It took on its name in 2003, but traces its legacy to the Department of Physical Education in 1930. It was the 1930 East Carolina Teachers College Planning Document number two priority. In 1938, the Department of Physical Education was established and Physical education became a specialty area for high school teachers. The College of Engineering and Technology comprises four departments. The college offers nine degrees including engineering, computer science, construction management, design, distribution and logistics, industrial engineering technology, information and computer technology, and industrial technology. The College of Allied Health Sciences offers 25 degree and certificate programs in health science disciplines primarily associated with health maintenance and rehabilitative services. The College comprises nine departments: Addictions and Rehabilitation Studies (addiction, clinical, and mental health counseling), Biostatistics, Clinical Laboratory Sciences, Communication Sciences and Disorders (Audiology and Speech-Language Pathology), Health Services and Information Management, Nutrition Science, Occupational Therapy, Physical Therapy, and Physician Assistant Studies. Bachelor of Science, Master of Science, Doctor of Audiology, Doctor of Physical Therapy, and PhD degrees are offered. Established in the 1967–68 school year as the School of Allied Health and Social Professions, the College of Allied Health Sciences is now located in the Allied Health Sciences building on the Health Sciences Campus and is the largest allied health college in the state. The College of Nursing is a professional school that offers one undergraduate degree, Bachelor of Science in Nursing. The school was created in 1959 and now offers Bachelor of Science, Masters, and Ph.D programs. The college has over 100 faculty teaching the students everything about the nursing field while practicing in the under-served Eastern North Carolina. There are three departments within this school: Department of Undergraduate Nursing Science Junior Division, Department of Undergraduate Nursing Science Senior Division, and the Department of Graduate Nursing Science. On October 12, 2007, the University of North Carolina Board of Governors permitted the re–designation of the School of Nursing to the College of Nursing. The National League for Nursing named the college a Center of Excellence. The college produces more nurses than any other school in the Mid-Atlantic region. The Graduate School consist of 85 master's degree, 21 doctoral programs and 62 certificates. It coordinates the graduate offerings of all departments in the nine colleges. The School also runs the non–professional degree programs of the professional School of Medicine. The school offers 17 master's degree in Accounting, Arts, Business Administration, Construction Management, Education, Environmental Health, Fine Arts, Library Science, Music, Nursing, Occupational Therapy, Public Administration, Public Health, School AdministrationScience, Social Work and Teaching. It also offers four doctoral degrees in Audiology, Education, Philosophy, and Physical Therapy. The Brody School of Medicine is a professional school at the university. It consists of seven graduate majors, plus the Doctor of Medicine, all located on the Health Sciences Campus. The first appropriations were approved in 1974, with the first medical students arriving in 1977. The medical school is one of five in North Carolina. The School of Dental Medicine is a professional school at the university. The school graduates one degree, Doctor of Dental Medicine. It also has three residencies in Advanced Education in General Dentistry and Dental General Practice. The school also offers a specialty program in Pedodontics. It was founded on February 24, 2006 at the East Carolina Board of Trustees meeting. The dental school was unanimously approved by the UNC System Board of Governors as well. The facilities are located on the Health Sciences Campus and will house the first three years of education. Dental students will complete their final year at ECU Community Service Learning Centers to be located throughout the state. The School of Dental Medicine is one of two dental schools in the state. Randolph Chitwood, a cardiothoracic surgeon with East Carolina, performed the first minimally invasive robotic-assisted mitral-valve heart surgery in the United States. East Carolina researchers also developed an electronic fluency device called SpeechEasy; the device is designed to improve the fluency of a person who stutters by changing the sound of the user's voice in his or her ear. Walter Pories, a faculty member at The Brody School of Medicine developed the standard procedure for gastric bypass surgery. Researchers here also first discovered that 80% of obese/type 2 diabetic patients who underwent this surgical procedure had a reversal of the disease. The Biofeedback Lab is currently developing techniques to help service members recover from posttraumatic stress disorders and traumatic brain injuries they received in Afghanistan and Iraq. The in vitro fertilization program is ranked first in North Carolina and fourth overall in the United States. Jason Bond, a former scientist in the Department of Biology, discovered many new species of spiders, including Myrmekiaphila neilyoungi and Aptostichus stephencolberti. During an archaeological dig on Hatteras Island in 1998, archaeologists discovered a 10-carat gold English signet ring from the 16th century, among other artifacts. The discovered ring was the first material connection between The Lost Colony on Roanoke Island and the Algonquian peoples on Croatan Island. In 2011, underwater archaeologists raised the anchors of the Queen Anne's Revenge, the flagship vessel of Blackbeard, near Beaufort. The Joyner Library clock tower. J.Y. 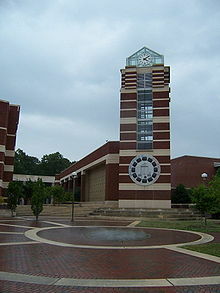 Joyner Library is the main library located beside the Mall on the main campus. It holds nearly 1.9 million bound volumes, 2.1 million pieces of microform, 532,000 government documents, and more than 24,000 journal subscriptions. The library, which houses the East Carolina manuscript collection, is the largest library east of Raleigh. It is one of the leading repositories in the nation for modern naval and maritime history. It also holds materials related to North Carolina, the tobacco industry, worldwide missionary activities, and American military history. The library is the official repository of the records of the United States Coast Guard Auxiliary. The J. Edgar Hoover Collection on International Communism contains many items dealing with communism worldwide. The Rare Book Collections has items dating from 1589, including a 1733 Edward Moseley map, the first to comprehensively map the colony of North Carolina and the only original copy in the United States. The Music Library is a branch of Joyner Library located on the first floor of A.J. Fletcher Music Center. It houses approximately 93,000 items, including the entire audio recording collection. It is the largest music collection east of Raleigh. The primary users of the library are faculty and students within the School of Music and the School of Theatre and Dance, but anyone can use its resources. It began in the 1958–59 academic year when a small library was created. Today a staff of five oversee the library duties. The William E. Laupus Library is the medical and health library for East Carolina. It is the primary library for the Brody School of Medicine, the College of Nursing, the College of Allied Health Sciences, and the School of Dental Medicine. It holds approximately 160,000 volumes (print and non–print) and 10,000 current print, non–print, and electronic serial titles. In 2006, it moved to the Health Sciences Building on the Health Sciences campus. The library is named for Dr. Laupus, a former Dean of Brody School of Medicine. There are ten social sororities at the East Carolina Campus, most of which own a house located at or near 5th or 10th Street. There are currently 18 social fraternities at East Carolina. The majority are located off or near 5th Street or 10th Street. Of the 18 social fraternities, seven currently do own a house. Greek life started in 1958 with the introduction of four social fraternities: With the first being Kappa Alpha Order. Later came Lambda Chi Alpha, Pi Kappa Alpha, and Theta Chi. Two years later, eight of the ten social sororities were founded. National Pan-Hellenic Council (NPHC) has a presence on campus, as well. There are four historically African American sororities and five historically African American fraternities. There are over 18 honor and 13 service or religious fraternities or sororities at ECU. ECU's sports teams, nicknamed the Pirates, compete in NCAA Division FBS as a full–member of the American Athletic Conference (The American). The Pirates joined The American on July 1, 2014. Dave Hart is the acting Athletic Director. The football team is supported by world-class spirit groups, such as the East Carolina University Marching Pirates, National Award-winning Cheerleading squads, and spirit teams. Facilities include the 50,000-seat Dowdy–Ficklen Stadium for football, the 8,000–seat Williams Arena at Minges Coliseum for men's and women's basketball, and Clark-LeClair Stadium, with a seating capacity of 3,000 (max capacity of 6,000+ when including outfield "Jungle" areas) for baseball. The Ward Sports Medicine building comprises 82,095-square-foot (7,600 m2) and houses the athletic department, Pirate Club offices and the Human Performance Laboratory. Athletes train in the Murphy Center a 52,475-square-foot (4,875 m2) edifice, housing the strength and conditioning facilities, along with banquet rooms, sport memorabilia, and an academic enhancement center. The Murphy Center was built for approximately $13 million and opened its doors to ECU student–athletes in June 2002. The EDC Mini-grant Project-The Office of Equity, Diversity, and Community Relations developed this project to improve East Carolina University's number of diversity studies, programs, and groups. This project intends to supply resources and funds towards diversity proposals offered by students, campus organizations, faculty, and staff. These programs include monitoring cultural awareness educational seminars, to improve departmental climate, to recruit diverse students, for research for curriculum improvement, among others. The University of North Carolina Board of Governors are the policy-making body legally charged with "the general determination, control, supervision, management, and governance of all affairs of the constituent institutions." It has 32 voting members who are elected by the General Assembly for four-year terms. In 2016, East Carolina was classified by U.S. News & World Report as a National University in its Top-tier rankings. In 2010, Forbes ranked the school 36th in its America's Best College Buys story. In the 2012 edition of U.S. News & World Report, The Brody School of Medicine is ranked 10th in the country for primary care physician preparation, 13th in the rural medicine specialty and 14th in family medicine. In 2010, Brody was ranked seventh on the social mission scale. The College of Business is named one of the best business schools according to The Princeton Review for the fifth year in a row. The College of Business is also named by GetEducated.com as the third best buy for affordability and quality in the Online Masters of Business Administration (AACSB-accredited) category. In 2009, the university was awarded the Patriot Award. The Patriot Award recognizes employers who go above and beyond what the law requires in supporting their employees who serve in the National Guard or reserves. In 2010, the university was awarded the Secretary of Defense Employer Support Freedom Award. It is the highest recognition given by the U.S. Government to employers for their outstanding support of their employees who serve in the Guard and Reserve. "Hail to Thy Name So Fair" is the alma mater at East Carolina University. It first appeared in the 1940–41 East Carolina Teachers College (ECTC)Student Handbook. It was written by Harold A. McDougle ('44) who became a part-time instructor in the Music Department from 1946 to 1947. The Marching Pirates perform the song during all home football and basketball games. At every home football game, after the National Anthem is played by the band, the Alma Mater is played followed by the E.C. Victory song. At the end of football games, the football team walks to the student section to sing the Alma Mater and E.C. Victory song in unison. Pirate graduates have been influential in teaching, business, and the arts. Nia Imani Franklin, American composer and beauty pageant titleholder, who graduated in 2015, was crowned Miss New York and Miss America 2019, the first without the swimsuit competition segment. Actress Emily Procter, Beth Grant, and screenwriter Kevin Williamson, creator of Scream and Dawson's Creek, graduated from East Carolina. Acclaimed screen actress Sandra Bullock attended, but graduated later after leaving to pursue her acting career. Marcus Crandell (born June 1, 1974, in Charlotte, North Carolina) is a former quarterback and current coach in professional Canadian football; he played 11 seasons for the Edmonton Eskimos, Calgary Stampeders and Saskatchewan Roughriders from 1997 to 2008 while also spending time in NFL Europe and the XFL. Crandell was named the Grey Cup Most Valuable Player after the Stampeders won the 89th Grey Cup in 2001. Class of 1974 Alumnus Rick Atkinson, wrote An Army at Dawn: The War in North Africa, 1942–1943 followed by "The Day of Battle, The War in Sicily, 1943–1944" and Dan Neil wrote criticism on automobiles; both received Pulitzer Prizes. Ron Clark, a teacher, author, and founder of the Ron Clark Academy in Atlanta, Georgia. James Maynard graduated with a degree in psychology and founded the Golden Corral restaurant chain. Kelly King is the current chief executive officer for BB&T and graduated with an undergraduate degree in business accounting and a master's of business administration. Former Jacksonville Jaguars quarterback David Garrard attended where he majored in Construction Management. Chris Johnson was drafted by the Tennessee Titans in the first round of the 2008 NFL Draft. WWE Chairman and CEO Vincent K. McMahon and his wife Linda McMahon both graduated with a degree in business administration as well. Scott Avett of the folk-rock band The Avett Brothers earned degrees in 1999 and 2000. Henry "Gizmo" Williams, Canadian Football League inductee, graduated from East Carolina University. ^ 2018 "Consolidated Foundational Financials" (HTML). Facilities and Resources Committee. East Carolina University Advancement. Retrieved December 3, 2018. ^ a b c d "ECU Enrollment Rises the Daily Reflector". East Carolina University. Retrieved 5 August 2015. ^ a b c "RECORD ENROLLMENT Paint this one purple". Retrieved 2 April 2018. ^ "East Carolina University Style Guide" (PDF). August 22, 2017. Retrieved September 5, 2017. ^ "East Carolina University". Featured Campus Profiles. US Journal of Academics. June 2007. Archived from the original on 2011-07-17. Retrieved 2007-06-11. ^ "Greenville Gets the School". The Daily Reflector. July 11, 1907. p. 2. Retrieved 2007-07-14. ^ a b c "Facilities". Quick Facts. East Carolina University. February 16, 2010. Retrieved 2010-02-20. ^ a b "ECU Field Station for Coastal Studies at Mattamuskeet". Mattamuskeet Field Station. College of Arts and Sciences - East Carolina University. 2001. Retrieved 2007-06-11. ^ "Brief Description" (PDF). East Carolina University. The University of North Carolina - General Administration. June 30, 2006. Archived from the original (PDF) on July 20, 2011. Retrieved 2007-07-16. ^ a b "Chapters". Greek Life. Division of Student Life. 2007-04-11. Retrieved 2007-06-11. ^ "East Carolina University". America's Best Colleges 2007. U.S. News & World Report. 2007. Retrieved 2007-06-10. ^ "An Act to Stimulate High School Instruction in the Public Schools of the State and Teacher Training". North Carolina Public Laws 1907, Chapter 820. North Carolina General Assembly. 1907-03-08. Retrieved 2007-06-10. ^ "Joyner Library exhibit features "father" of ECU" (Press release). ECU - News Bureau. 2007. Retrieved 2007-06-10. ^ "An East Carolina Memoir by Henry C. Oglesby" (Press release). Pieces of Eight. 1982-02-15. Retrieved 2007-06-10. ^ "East Carolina University Timeline". University Archives. East Carolina University - Joyner Library. 2007. Retrieved 2007-06-10. ^ "Thomas Jordan Jarvis - Father of East Carolina University". Joyner Library, East Carolina University. 2007. Archived from the original on 2006-09-19. Retrieved 2007-06-11. ^ National Governors Association (2004). "North Carolina Governor Thomas Jordan Jarvis". Governor's Information. National Governors Association. Archived from the original on September 30, 2007. Retrieved 2007-06-11. ^ "Residence Halls". Residence Halls. East Carolina University - Campus Living. 2009. Archived from the original on 2010-01-24. Retrieved 2010-02-20. ^ "Murphy Center". Facilities. East Carolina University Athletics. Retrieved 17 August 2011. ^ "Ward Sports Medicine Building". Facilities. East Carolina University Athletics. Retrieved 17 August 2011. ^ "Scales Field House". Building Information. Joyner Library, East Carolina University. Retrieved 17 August 2011. ^ "Pirate Club". Building Information. Joyner Library, East Carolina University. Retrieved 17 August 2011. ^ "Cliff Moore Football Practice Facility". Facilities. East Carolina University Athletics. Retrieved 17 August 2011. ^ "Lewis Field at Clark-LeClair Stadium". Facilities. East Carolina University Athletics. Retrieved 17 August 2011. ^ a b "Our Facilities". Undaunted. Retrieved 17 August 2011. ^ "Pitt County Memorial Hospital". Pitt County Memorial Hospital. University Health Systems of Eastern Carolina. 2009. Retrieved 2010-02-20. ^ "About University Health Systems of Eastern Carolina". University Health Systems of Eastern Carolina. 2009. Archived from the original on 2010-09-04. Retrieved 2010-02-20. ^ "Division of Health Sciences". Division of Health Sciences. 2007. Retrieved 2007-06-11. ^ "Leo W. Jenkins Cancer Center" (PDF). ECU Physicians. 2008. Archived from the original (PDF) on 2010-06-02. Retrieved 2010-02-20. ^ "ECU breaks ground for new Family Medicine Center". Division of Health Sciences News. 2008. Archived from the original on 2012-10-13. Retrieved 2010-02-20. ^ "Groundbreaking Ceremony". ECU School of Dentistry. 2008. Archived from the original on 2010-03-06. Retrieved 2010-02-20. ^ Latham, Art (2002). "N.C. Agromedicine Institute obtains health research grant". Perspectives Online. North Carolina State University. Retrieved 2007-06-11. ^ "Mission, Vision, Goals". North Carolina Agromedicine Institute. Archived from the original on October 15, 2004. Retrieved 2007-06-11. ^ "History: A Legacy of Commitment". About the School. The Brody School of Medicine. January 15, 2007. Archived from the original on February 25, 2007. Retrieved 2007-07-16. ^ a b "Small Business Institute". College of Business. East Carolina University. 2007-06-22. Archived from the original on 2007-06-10. Retrieved 2007-07-15. ^ Boyd, Doug. "ECU breaks ground for Ahoskie dental center". Health Sciences News. Archived from the original on 20 September 2011. Retrieved 25 August 2011. ^ "News Story | Division of Health Sciences | East Carolina University". Ecu.edu. Archived from the original on 2014-08-26. Retrieved 2014-08-24. ^ "Field Station for Coastal Studies at Mattamuskeet". ICW-NET, LLC. 2004. Archived from the original on 2007-07-04. Retrieved 2007-06-11. ^ "Mattamuskeet Field Station" (PDF). East Carolina University. September 2006. Archived from the original (PDF) on 2007-12-02. Retrieved 2007-06-11. ^ "Lake Mattamuskeet Pump Station". North Carolina - Hyde County. National Register of Historic Places. 1980. Retrieved 2007-06-11. ^ "North Recreational Complex". East Carolina University. 2007-12-03. Archived from the original on 2009-10-30. Retrieved 2008-02-13. ^ "North Recreational Complex" (Press release). Facilities Engineering and Architectural Services - East Carolina University. Retrieved 2007-06-10. ^ "ECU breaks ground on new athletic complex". ECU - News Bureau. 2006. Retrieved 2007-06-10. ^ Steele, Janis. "ECU's North Recreational Complex to Open its Phase II in August" (PDF). East Carolina University News Service. Archived from the original (PDF) on 17 October 2012. Retrieved 31 August 2011. ^ "Undergraduate and Graduate Degree Programs". Undergraduate Catalog 2011–12. Retrieved 26 September 2011. ^ White, Alan (2007-03-05). "The Liberal Arts". Thomas Harriot College of Arts and Sciences. East Carolina University. Archived from the original on 2009-11-07. Retrieved 2007-06-11. ^ "Welcome to Thomas Harriot College of Arts and Sciences". Thomas Harriot College of Arts and Sciences. East Carolina University. 2006-09-25. Retrieved 2007-06-11. ^ "School of Business, One of Finest in the Country" (Press release). ECU Report, Volume 15, No. 1. January 1983. Retrieved 2007-06-11. ^ "College of Business Statistics". About the College of Business. East Carolina University - College of Business. 2007-03-05. Archived from the original on 2007-07-11. Retrieved 2007-06-11. ^ "College of Business". Graduate Management Admission Council. 2007. Retrieved 2007-06-11. ^ "College of Education Fact Sheet - Spring 2009" (PDF) (Press release). College of Education. 2009. Archived from the original (PDF) on 2012-10-13. Retrieved 2010-02-20. ^ "College of Education Fact Sheet". East Carolina University College of Education. East Carolina University. 2007. Archived from the original on 2007-05-04. Retrieved 2007-06-10. ^ "About the College". ECU College of Fine Arts & Communication. College of Fine Arts & Communication. 2009-12-09. Archived from the original on 2010-03-01. Retrieved 2010-02-20. ^ "History of the College of Health and Human Performance" (PDF). The College of Health & Human Performance. 2007-01-11. Retrieved 2007-06-11. ^ "College of Technology and Computer Science". College of Technology and Computer Science. East Carolina University. 2006-09-14. Retrieved 2007-06-24. ^ a b "Request for Authorization to Establish a Bachelor of Science Degree in Engineering at East Carolina University" (PDF). Appendices for the minutes on March 19, 2004. The University of North Carolina. 2004-05-18. Retrieved 2007-06-24. ^ "The College of Allied Health Sciences". East Carolina University. 2007-05-16. Retrieved 2007-06-11. ^ Brown, Sylvia T. (2007-06-11). "Welcome from the Dean". About us. School of Nursing. Archived from the original on 2012-08-05. Retrieved 2007-06-11. ^ "History". The College of Nursing at East Carolina University. Archived from the original on 10 December 2004. Retrieved 15 September 2011. ^ ECU, Student (2007-10-23). "Two East Carolina University schools have been re–designated as colleges". Archived from the original on 2008-06-06. Retrieved 2007-12-06. ^ "2008-2011 Centers of Excellence Designees". National League for Nursing. Archived from the original on 30 May 2011. Retrieved 15 September 2011. ^ "Academics". Undaunted. East Carolina University. Retrieved 15 September 2011. ^ "Masters Programs". Graduate School. East Carolina University. Retrieved 2007-07-16. ^ "Certificate Programs". Graduate School. East Carolina University. Retrieved 2007-07-16. ^ "Doctoral Programs". Graduate School. East Carolina University. Retrieved 2007-07-16. ^ "Academic Programs". Graduate School. East Carolina University. Retrieved 2 June 2011. ^ Board of Trustees (2006-02-24). "Board of Trustees Meeting" (PDF). East Carolina University. pp. 15–16. Archived from the original (PDF) on 2007-12-02. Retrieved 2007-06-10. ^ Martin, Harold (2006-11-03). "Request to Establish a Doctor of Dental Surgery Degree Program at East Carolina University" (PDF). Appendix O. University or North Carolina Board of Governors. Archived from the original (PDF) on 2010-06-13. Retrieved 2007-06-10. ^ "Doctor of Dental Surgery Degree Program at East Carolina University" (PDF). Report of the Committee on Educational Planning, Policies, and Programs. The University of North Carolina - Board of Governors. 2006-11-10. Archived from the original (PDF) on 2011-07-20. Retrieved 2007-06-10. ^ Pories, WJ; MacDonald KG, Jr; Flickinger, EG; Dohm, GL; Sinha, MK; Barakat, HA; May, HJ; Khazanie, P; Swanson, MS; Morgan, E; Leggett-Frazier, N.; Long, S.D. ; Brown, B.M; O'Brien, K.; Caro., J.F. (June 1992). "Is type II diabetes mellitus (NIDDM) a surgical disease?". Annals of Surgery. 215 (6): 633–42, discussion 643. doi:10.1097/00000658-199206000-00010. PMC 1242519. PMID 1632685. ^ "About Joyner Library". J.Y. Joyner Library, East Carolina University. 2006-03-14. Archived from the original on 2007-03-10. Retrieved 2007-06-11. ^ "About the Music Library". Joyner Library, East Carolina University. 2006-10-06. Archived from the original on 2015-12-23. ^ "About the Music Library". Joyner Library, East Carolina University. Archived from the original on 18 November 2010. Retrieved 29 September 2011. ^ "Music Library". Staff Directory. Joyner Library, East Carolina University. Retrieved 29 September 2011. ^ "History of the Library". Laupus Library. Laupus Library. 2007-02-27. Archived from the original on 2007-06-29. Retrieved 2007-06-11. ^ a b Lauten, Elizabeth (2007-03-08). "History of Greek Life". Pulse. The East Carolinian. Archived from the original on 2007-03-11. Retrieved 2008-02-13. ^ a b "East Carolina". Conference USA. 2007. Retrieved 2007-06-06. ^ Myatt, Al (2004). "Bingo! Search mission accomplished". Bonesville.net. Retrieved 2007-06-06. ^ Tuttle, Steve (2006). "Building the Future". East Magazine. Retrieved 2007-06-06. ^ "Inactive Content". Ecu.edu. Archived from the original on 2011-02-03. Retrieved 2014-08-24. ^ "President/Chancellor Bios". Joyner Library - East Carolina University. 2006-02-22. Retrieved 2007-06-11. ^ "East Carolina University Board of Trustees". Board of Trustees - East Carolina University. 2006-02-22. Retrieved 2007-07-05. ^ "Board of Governors names Cecil Staton as chancellor" (Press release). East Carolina University. 2016-04-27. Retrieved 2016-07-01. ^ "Best Colleges 2012". Best Colleges 2012. U.S. News & World Report. 2012. Retrieved 2012-09-13. ^ "America's Best College Buys". America's Best Colleges. Forbes. August 11, 2010. Retrieved August 12, 2010. ^ U.S. News; World Report (2007). "Top Medical Schools - Primary care". America's Best Graduate Schools 2012. U.S.News & World Report. Retrieved 2008-11-14. ^ Mullan, Fitzhugh; Chen, Candice; Petterson, Stephen; Kolsky, Gretchen; Spagnola, Michael (June 15, 2010). "The Social Mission of Medical Education: Ranking the Schools". Annals of Internal Medicine. Philadelphia, Pennsylvania: American College of Physicians. 152 (12): 804–811. doi:10.7326/0003-4819-152-12-201006150-00009. PMID 20547907. Retrieved July 9, 2010. ^ WNCT Staff. "ECU among top business schools". WNCT. Archived from the original on 26 December 2011. Retrieved 16 October 2011. ^ "Top Ranked Most Affordable Online MBAs - AACSB Accredited". Retrieved 2012-09-13. ^ "East Carolina University honored with Patriot Award". December 2, 2009. Retrieved July 9, 2010. ^ Phillips, Melissa (July 8, 2010). "Department of Defense Announces 2010 Secretary of Defense Employer Support Freedom Award Recipients". Employer Support Freedom Award. The Secretary of Defense Employer Support Freedom Award. Archived from the original on July 12, 2010. Retrieved July 9, 2010. ^ Batchelor, Scott (September 2, 2003). "Tailgating 101: What you need to know to tackle the tailgate Mixer". Daily Reflector. Retrieved January 11, 2012. ^ "Sandra Bullock". IMDB. Retrieved 2007-06-10. ^ Procter, Emily (2005). "Bio". Emily Procter Official Site. Emily Procter. Archived from the original on 2009-09-22. Retrieved 2007-06-08. ^ "Kevin Williamson Biography". Kevin Williamson. Yahoo TV. 2007. Retrieved 2007-07-08. ^ "History". 2003 winner. Pulitzer Board. 200. Retrieved 2007-07-08. ^ "History". 2004 winner. Pulitzer Board. 200. Retrieved 2007-07-08. ^ Churchill, Theresa (2007-06-10). "Best-selling author highlights upcoming diversity conference at Richland". Herald & Review. Retrieved 2007-06-10. ^ "Successful Businessmen" (Press release). ECU Report. January 1981. Retrieved 2007-07-08. ^ "Kelly S. King". Executive Profile. BB&T. Archived from the original on 2010-05-14. Retrieved 2010-01-01. ^ "David Garrard". Jacksonville Jaguars. Archived from the original on 2008-01-18. Retrieved 2008-02-08. ^ "Vince McMahon Biography (1945-)". A&E Television Networks. 2007. Archived from the original on 2006-06-23. Retrieved 2008-02-08. ^ "East Magazine - Portrait of the Artist". Ecu.edu. 2013-04-16. Retrieved 2014-08-24.